Beet Halwa – Welcome to Creative Rajni! Halwa is one of my favorites since my childhood days. I’ve always had halwas made out of fruits and wanted to try something unique and I came up with a halwa using a vegetable-Beets! 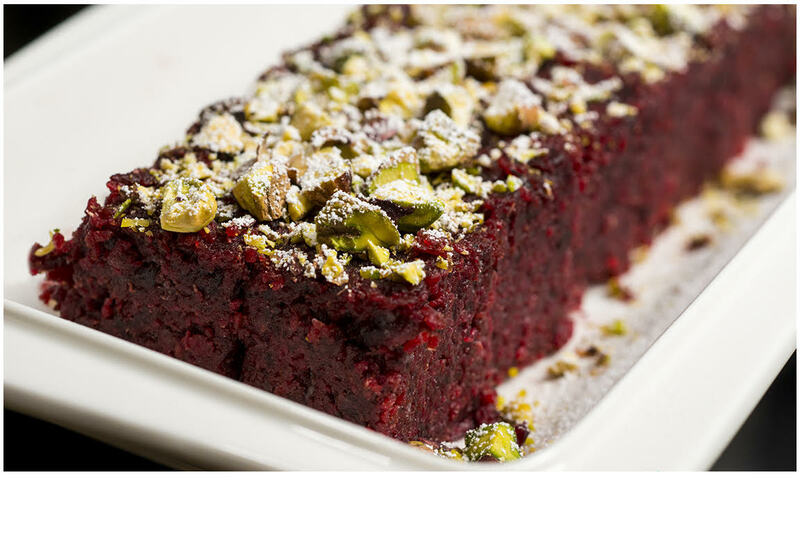 This is Beet halwa made with roasted semolina and milk powder and garnished with roasted pistachios and a dust of powdered sugar. Heat a pan (low heat) and add 2 tbsp ghee to it. Now add in the 2 cups grated beets. Saute it well for about 20-30 min until wilted and soft. Add in 4 tbsp powdered milk, 1/4 tsp cardamom powder and stir well until milk powder is well combined into the beets for about 2 min. Now add in sugar. Mix well one more time until well combined with the beets. There will be a soft texture for the beets. Now add in the 2 tbsp semolina and saute well for 10 seconds. It’ll start to thicken. Now slowly add in the hot water and stir well to combine. Transfer this to flat baking pan or a brownie pan and let it set for about 1 hour. Garnish with pistachios on top and a little dust of powdered sugar. Cut into diamonds or squares.Enjoy!